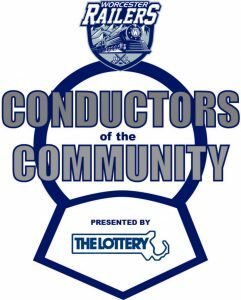 The Conductors of the Community program, presented by the Massachusetts State Lottery, is designed to honor individuals who have made a significant and positive impact in the Worcester community. The Conductors of the Community award is presented to individuals who, through their dedicated commitment and humanitarian spirit, have made exceptional and lasting contributions to our community. During the final seven Saturday Railers HC home games at the DCU Center (January 19th, January 26th, February 9th, March 9th, March 16th, March 30th and April 6th for the final salute), the Railers and their fans will salute the exemplary efforts of these individuals during a special in-game presentation. Each recipient will receive four tickets to a Railers HC game and be invited to watch warm-ups from the Railers bench. Tim Garvin, the president and CEO of the United Way of Central Massachusetts, received the first Conductors of the Community Award last season during the Worcester Railers game on Saturday, January 27, 2018. Tim has led the Central Mass United Way since 2006 and has spent his entire career in the non-profit sector. He is an active volunteer and advocate for the Worcester community. Last year, the Mass. Lottery returned over $997 million in net profit to the Commonwealth. These funds flowed back to the 351 cities and towns in Massachusetts and helped pay for local improvement projects, public safety, snow removal, and education initiatives, among other things. Nominations for the Railers Conductors of the Community can be submitted in the online form below.